The Avengers face their worst enemy yet, but they've got a secret weapon: Titan Hero Tech! This Interactive Hulk Buster figure has the massive strength of the gamma-green superhero, but he combines it with the high-tech super-armor of Iron Man! He says phrases like “Oh, this is power!” and interacts with other Titan Hero Tech figures (sold separately), saying “Cap, cover the perimeter” to Captain America and “Let's armor up!” to Iron Man Mark 43. His lights and battle sounds will make the battle against Ultron even more epic! 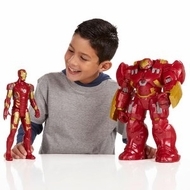 Team up your Interactive Hulk Buster figure with his fellow Avengers and start the battle for the fate of the world! Marvel products are produced by Hasbro under license from Marvel Characters B.V.